The Skinny: A strangely endearing coming-of-age story from the always interesting Takashi Miike. This nostalgic look back at childhood is neither warm nor fuzzy. Alternatively realistic and quirky, Young Thugs: Nostalgia is far more compelling than most films of its type. A prequel to Young Thugs: Innocent Blood. 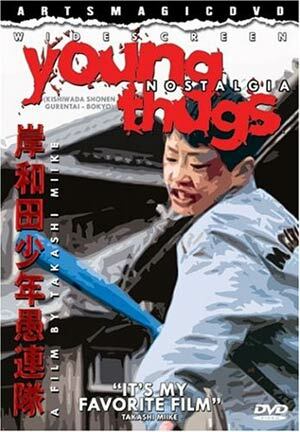 Takashi Miike tones down the gonzo violence and gets retrospective in Young Thugs: Nostalgia, a 1998 film the director claims is his personal favorite. There's a sense of realism to the proceedings, but it's not without its quirkiness. Things get weird early when the film's main character, Riichi, returns home after a fight at school. Rather than be concerned or upset, his parents hail him as the conquering hero. They even go so far as to throw a party in his honor where the guests praise his "honorable battle scar." Soon, it's revealed that his parents are functionally dysfunctional: his volatile father Toshi (Naoto Takenaka) cheats on his wife and generally acts like a jackass, his mother can't stand Toshi's betrayals and walks out on the family at various points in the film only to eventually return, and his grandfather, well, he's just plain weird. The Huxtables they aren't. Miss Ito (Saki Takaoka), a young teacher, takes an interest in Riichi's life, and visits his home. Just when you think the film is going to turn into a story about an idealistic young teacher changing the life of her n'er do well student, the filmmakers tweak convention by having the meeting of Miss Ito and Riichi's parents go horribly, horribly wrong. And by horribly wrong I mean that Toshi brutalizes Miss Ito, only to be punished by his own father. The comical sight of an elderly father spanking his full-grown son soon turns unbelievably bizarre when the grandfather basically sodomizes the boorish Toshi with the end of the broomstick right before the family's eyes. One quick jab and the scene is over, but it did leave this reviewer scratching his head in bewilderment. But don't let that strange interlude fool you; that's the sole gross-out moment in Young Thugs: Nostalgia. While not homogenized in the least, the rest of the film is remarkably touching and funny. The film earns big laughs in its creative use of images and sound, in particular when Riichi finds himself hounded by a gang of prepubescent thugs. Each time they make an appearance, the theme from For a Few Dollars More plays, and Miike cuts the scenes in that grand Sergio Leone style. This scene should feel out of place, but somehow it works, really enhancing the gunslinger vibe that each of these fights give off. In one of the best parts of the film, Riichi and his friends enter a school contest in order to win a prize for another character's senile grandmother. Rather than simply steal the prize (it's available in any store), they choose to earn itthough for some reason, that doesn't stop them from stealing the supplies they need to create their project. In the end, these young thugs definitely have principles, morally selective as they may be. The believability of their scenes are a testament to the abilities of the child actors, all of whom pull off their roles quite well. Through the eyes of Riichi, we can understand the story as a lament on the loss of innocence, a reflection on the "good ol' days" in Osaka, and a celebration of childhood.